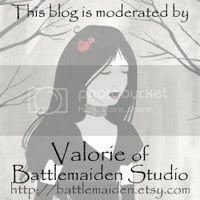 Battlemaiden Studio: A bit of catch up! I've wanted to post so many times over the past few weeks, but I didn't want to bury our lovely dolls until their auction was over! They should be going in the mail today to meet their new families, no later than tomorrow (trying to get car insurance sorted out before I leave the house... it would be my luck). Halloween was a lot of fun. Morrigan is old enough now to go trick or treating, so we dressed her up and took her to the mall where she could run and play with the other little ones and go store to store for candy. I have been such an art slacker recently. Still having a hard time getting things moving. Making another effort today to get some small things done and hopefully give my creativity a kick start. What a sweetie! And happy birthday!